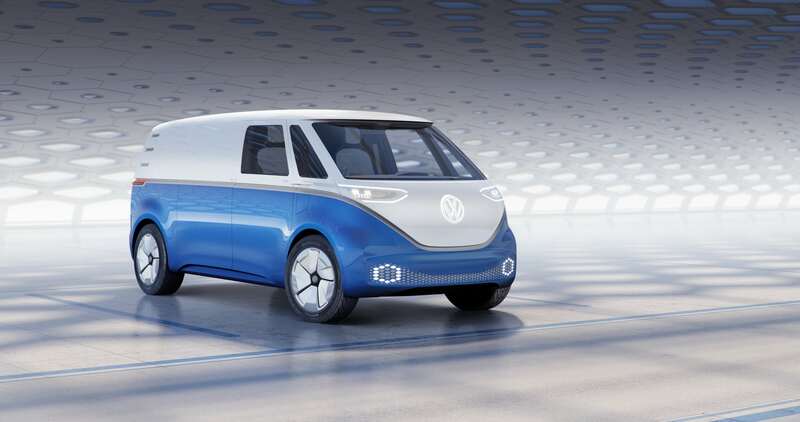 This concept vehicle shows how Volkswagen Commercial Vehicles is launching into the new era of electric mobility. Back in August, the company already presented the brand's first all-electric van with the world premiere of the new e-Crafter. While the e-Crafter launched as a panel van with an overall length of 235.7 inches and a maximum payload of 1.75 tons, the I.D. BUZZ CARGO concept is positioned a size below the Crafter. The payload (maximum load) of the concept vehicle is 1,760 pounds. The I.D. BUZZ CARGO is 198.7 in long, 77.8 in wide and 77.3 in tall, with a wheelbase of 129.9 inches. Since the rear overhang was extended by about 4 inches, the cargo version of the I.D. BUZZ is significantly longer than the vehicle shown in Detroit. Outside, the I.D. 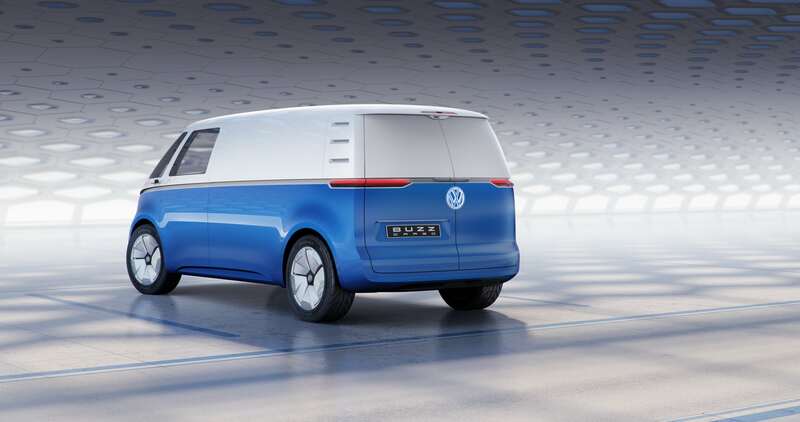 BUZZ CARGO concept is differentiated from the I.D. BUZZ by a new solar roof, wide-opening rear wing doors and a new rear bumper. With a view towards optimizing cargo space via a shelving system, there is no sliding door on the driver’s side, typical of LCVs. The front doors and sliding door open electrically. Unlocking the vehicle from the outside is activated via a sensor. The I.D. BUZZ CARGO recognizes authorized persons via a digital key which is sent to the van from a smartphone. Instead of the 22-inch wheels of the Detroit concept vehicle, new 20-inch wheels are used with 235/55 tires. The solar module on the roof fits into this picture. The photovoltaic system generates so much energy that it is able to extend the range of the I.D. BUZZ CARGO by up to 9.3 miles a day. So the longer the concept vehicle stands in the sun, the further it can drive later. The interior has also been tailored for commercial use, down to the smallest detail. From the driver's cab to the rear, the I.D. BUZZ CARGO is a unique concept. Instead of two single seats, the concept vehicle is equipped with the driver's seat and a double bench-seat on the front passenger side. The middle seat can be folded down. This opens up a workplace, at which the driver can take care of organizational matters via an integrated laptop. In the automated "I.D. Pilot" mode this can even be done on the move. The driver activates the Level 4 autonomous mode by simply pushing on the steering wheel for a few seconds. It then retracts into the redesigned instrument panel. Thereafter the driver's seat can be turned 15 degrees to the right in order to enable the on-board computer to be operated from the ideal ergonomic position. (Please note: the I.D. Buzz Cargo will not be on display November 30 due to scheduling conflicts).